The stock fan, particularly on older ANAN-100 and ANAN-100D can be very noisy. On my older ANAN-100D, this mod resulted in my fan noise going from unbearable to absolutely inaudible. If your fan noise isn't intolerably loud, you probably don't need this mod. The NB-Multiframe S-Series M8-S3HS delivers comparable air flow with very low noise. Use the screen panel/filter under the original fan. You may (or may not) have to purchase new longer mounting screws for the new fan. My fan did NOT come with mounting screws (see below). You need to remove both the front and rear panels. One tool you really should have to make your life easier is a 14mm ratcheting box wrench for the BNC connector nuts. 1. Remove 6 back panel screws and 8 BNC connector nuts (14mm). 2. Remove 6 front panel screws. Power switch is snap fitted to the steel button, release the plastic locks to free the switch body (this did NOT work for me) or just wiggle the switch body while pulling (this DID work for me). 3. Remove two SMA connectors behind front panel on upper right after marking one of the plug/jacks for ID in reassembling. Be very careful with the inboard of the two because there's a delicate xfmr mounted right behind it and you can easily break the leads that it's suspended by. 4. Remove ribbon cable from Angelia J15 on the bottom plate after sliding it forward, note orientation. In order to slide the bottom plate far enough forward, reflect the rear panel around toward the bottom so that it will slide forward along with the bottom plate. Note, there are two identical sets of 10-pin stake pin connectors and J15 goes in the one on the right. 5. Slide bottom plate as far back as you can. On the rear, take an 8mm open-end wrench and remove the SMA connector, 2nd from right. You should be able to just reach it. 6. Slide the bottom plate out further toward the rear and remove the original fan and screen (7mm). Pull up on the fan's white molex power connector with long nose pliers to remove it. 7. Cut off the white molex connector and two inches of red/black wire leads from the old fan. Cut the cable back to 2 inches on the new fan (discard any outer sleeving), peel back & cut the white wire, and splice/solder the red-red/black-black wires together and insulate with heat-shrink tubing. 8. The new fan has rubber corner blocks and a rubber gasket. Discard the rubber gasket. Use 6-32 X 1-1/4in screws (my fan didn't come with screws), nuts and flat washers. Place the screen between the fan and chassis, flat edges of screen toward the chassis. It's a tight fit with the 1-1/4in screws but it will work if you squeeze and any longer screw won't fit due to clearance on the top. 9. Checking that the wires are oriented in the same direction as the original, mount the fan with the screws passing through the rubber corner blocks — do not over-tighten, it is rubber, not plastic, and will slip if you over do it. The stickiness of the rubber keeps the screws from backing out without them being super-tight. The vertical arrow on the side of the fan should be oriented upward. Plug the fan connector back in. 12. Reconnect two SMA connectors in the front, making sure flats are orthogonal to front panel so power switch will fit between. Again, be very careful with the inboard of the two because of the delicate xfmr behind it. 13. 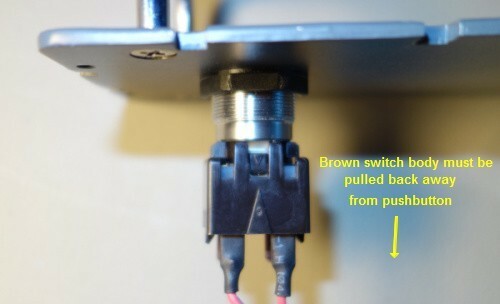 Refit power switch body into push button by pushing on. Check that the screen between the fan and the bottom is not plugging with lint — if it is, remove it. Also try really tall feet or blocks under the unit — the fan inlet is a major bottleneck. Some folks drill out and enlarge the hole pattern to address the relatively low air flow with the stock 80mm fan size. Putting the rig on a wire shelf will also slightly enhance the cooling. Flipping the radio on its side will certainly enhance the cooling. 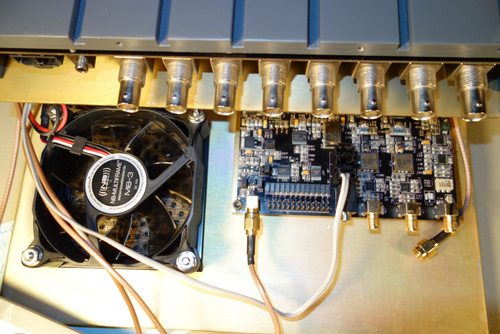 The real trick is to get airflow over BOTH the transceiver board and the filter/PA board. I am suggesting that, by plugging the holes in the shielding plate between the boards and plugging the holes in the rear plate below the shielding plate, you force ALL the air from the fan to flow over the Hermes/Angelia board, around the front, and then back over the filter/PA board before exiting the rear of the transceiver. The holes for cable routing are more than large enough to accommodate the flow of air from one side of the shielding plate to the other. The way the ANAN stations are constructed, the internal fan is not cooling the cabinet at all. The fan draws air through the bottom plate. The shielding plate between the Hermes/ Angelia board has a hole in it that let the air go through and cools the components on the PA/ filter board and then leave through the back plate. As the PA/ Filter board covers the hole inside of the cabinet, there will be no cooling of the cabinet. The transistors are fastened to the cabinet and depends totally of the cooling from it. So the only way to cool the ANAN is by using a external fan. Cooling system #1, the fan (an NMB MAT 3110SB-04W-B20), would seem to be primarily designed to cool everything except for the power supply and the RF power transistors. Unfortunately the air comes in through a very severe restriction in the bottom plate, then most goes straight out the back not flowing over any components since it's reflected by similar severe restriction in the middle plate. Whatever does make it through the restriction in the middle plate pretty much goes nowhere after that, although some tiny amount may come back around through the cable clearance notch in the front corner and then out the rear panel vent holes. Cooling system #2, the case, provides ONLY natural convective cooling for the RF power transistors and power supply. In my case, at least, natural convection is not sufficient. The power supply is bolted to the bottom panel, and, more importantly, the RF power transistors are bolted to the top cover with some sort of thermal interface material behind the PA board. I did not disassemble the PA board from the case for further inspection as I don't have any appropriate replacement thermal interface material on hand, just in case it was damaged during disassembly. For now I'm just going to find a fan to blow onto the outside of the stock case. I recently did this cooling mod: Remove the restrictive holes on the bottom plate by cutting a larger hole and use the existing EMI screen to fill that hole. It has been the most effective one I've made. I previously added a fan above and below to cool the case. The one above I think I can dispense with, the heat sink used to get quite warm at lowish power (40w on JT65) with just the external fans, but is now barely above ambient with the hole in the lower plate opened out. I haven't enlarged the hole in the middle plate as I thought the path through the gap at the front corner gives a better air path through the amplifier.